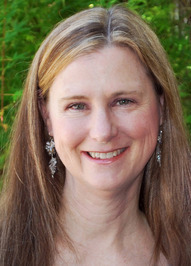 I am so happy to have Syrie James visiting The Book Tart! We have a quickie 😉 and chat books, Colin Firth and costumes. She’s just as darling as I remembered. I’d met her briefly at a Romantic Times Book Convention in 2011 (I think). She made an impression on me then and her stories have stuck with me. She writes beautiful, haunting stories that make you think AND sigh. 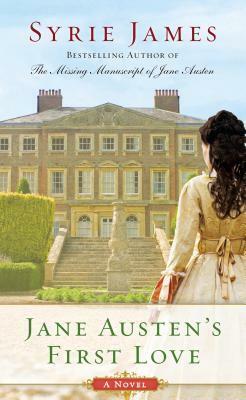 Take a look at her newest release Jane Austen’s First Love and then add the rest of her books to your TBR stacks. Me: Syrie! You’re here! Come in come in. Please sit down and make yourself at home. *waves towards red love seat* Can I get you anything? Tea, water, coffee, soda…. Syrie: I’m excited to be here! Thanks so much for inviting me. I’d love a nice, tall glass of ice water, if that’s not too much trouble. *sinks down onto the love seat* Wow, this is super comfy—and what a beautiful color! I so want a red velvet sofa. That’s going on my Wish List. * smiles* It’s great to see you, Kat! Me: I’m delighted to see you again too. *sinks down on couch and passes Syrie her drink* Oh! I have a cupcake too. *scoots cupcake tray closer and swipes a chocolate one*. Syrie: You have cupcakes?! This is rapidly becoming my favorite interview ever! *snags a chocolate cupcake, unwraps it, and takes a bite. * Mmmmm. Me: We briefly met in LA at the RT Booklovers convention. <g> I took a photo for you in front of your promo stuff in swag alley I think… That was for the release of Nocturne. Syrie: No way! I remember that photo. It was so nice of you to take it! Thank you! *puts cupcake down, grabs iPad, quickly scans photos. *Look! Here it is! This was three years ago. You’re right, I was promoting Nocturne at that convention, and I remember I did a huge book signing event that day for my novel Dracula, My Love—which explains why I’m all tarted up in my black velvet Victorian outfit, complete with flowered hat. I LOVE your costumes! You make most of them don’t you? Syrie: Yes, I make most of them—although the velvet jacket I’m wearing in this photo is a true vintage garment. I bought it while researching my Charlotte Brontë novel in Haworth, England, at an antique shop just down road from the parsonage where the Brontë family lived. I was told it’s about 150 years old and the label identifies it as being made by a tailor in Bradford, a town not far from Haworth. It’s delicately constructed with an inset boned corset and tiny hook closures. What a thrill it was to wear it! I love to sew and made all the other costumes I own, which I like to refer to as “period attire.” 😉 I now have six Regency gowns with matching reticules, an assortment of bonnets, and four feather headdresses, which I enjoy wearing to the annual JASNA AGMs. I love having an excuse to play dress-up! Me: Wow! Thanks hon. I love knowing a bit of the history behind your costumes. Your closet must be incredible! 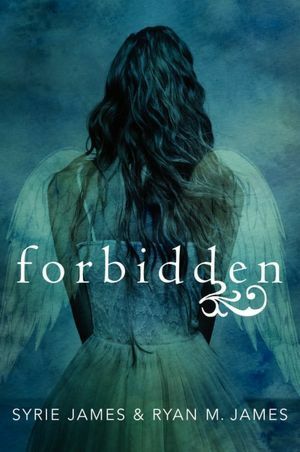 Syrie: I’m working with my son Ryan on the sequel to Forbidden, the YA novel we co-wrote. We’ve had so many readers plead for a sequel, which is awesome, and we always had one in mind, but didn’t have time to write it before. It’s still difficult to fit it into our schedules, but we’re making progress! Meanwhile I’m contemplating ideas for my next solo book, and busy spreading the word about my new novel, Jane Austen’s First Love. Syrie: I can’t begin to tell you how much fun I had writing this book! The best part is that it’s about a real life relationship Jane had when she was a teenager, with a young man the world never knew much about before. I did tons of research and discovered a trove of new information about Edward Taylor. He was rich, super smart, athletic, extremely well-read and well-traveled, and incredibly accomplished–which helps explain why Jane fell head over heels in love with him! I loved climbing into the head of a vivacious Jane Austen at age fifteen, and bringing her and Edward to life during the special summer of 1791 when they fell in love. Fifteen-year-old Jane Austen dreams of three things: doing something useful, writing something worthy, and falling madly in love. When she visits her brother in Kent to celebrate his engagement, she meets wealthy, devilishly handsome Edward Taylor—a fascinating young man who is truly worthy of her affections. Jane knows a match between her and Edward is unlikely, but every moment she spends with him makes her heart race—and he seems to return her interest. Much to her displeasure, however, there is another seeking his attentionUnsure of her budding relationship, Jane seeks distraction by attempting to correct the pairings of three other prospective couples. But when her matchmaking aspirations do not all turn out as anticipated, Jane discovers the danger of relying on first impressions. The human heart cannot be easily deciphered, nor can it be directed or managed. And if others must be left to their own devices in matters of love and matrimony, can Jane even hope to satisfy her own heart? 1. Have you ever been horse riding? 2. Have you ever been horse riding? 3. Have you ever needed stitches? Hasn’t everyone? Three circumstances immediately come to mind: the birth of both of my sons (totally worth every stitch!) and minor surgery on a finger. 4. If you had a warning label, what would yours say? WARNING: Liable to lose self-control if tempted by chocolate or a sighting of Colin Firth. My fav is the purple Regency gown I just made for the JASNA AGM in Montreal, when I played the hussy Maria Bertram in the play I co-wrote and produced, “A Dangerous Intimacy: Behind the Scenes at Mansfield Park.” The gown is constructed from an embroidered net overskirt over purple satin, with a pin-tucked bodice, beaded spangles at the empire waist, and three appliquéd or ruffled flounces at the hem. Oh My goodness! LOVE the details! 6. What country would you like to visit that you haven’t yet? I can’t only pick one! Australia, New Zealand, Ireland, China… and I’m just getting started. 7. Who’s your favorite Superhero? 8. What’s your favorite old fashioned word (and what does it mean)? Shuttlecock. 😉 It means badminton. 9. Have you ever eaten dessert first? I don’t think so. I love my sweets, but prefer them after a meal. 10. What’s the last movie you saw in a theater? 11. What can you see out of your window? My office is on the second floor of our house, and I have a beautiful view of our garden and swimming pool, palm trees swaying in the breeze next door, and the rooftops of neighboring houses. Me: Thank you hon for hanging out with me at The Book Tart, I’m so happy to help you celebrate the release of Jane Austen’s First Love and I hope you come back and play in Tartlandia again! In addition to her work as a novelist, Syrie is a screenwriter, a member of the Writers Guild of America, and a life member of the Jane Austen Society of North America. An admitted Anglophile, she loves romance and all things 19th century. Syrie welcomes visitors and messages at www.syriejames.com, and invites you follow her on Facebook and on Twitter. Great interview. Makes me want a cupcake. I love the black velvet dress. The story of the jacket is so neat. Awww thank you! Syrie is darling and I loved learning more about her costumes and asking her silly questions. I’m glad you joined the fun! Colin Firth makes me swoon, too. Thank you for the enjoyable interview! I think dressing in period costume gives an excellent perspective into period characters- clothing follows social mores and dictates, and can constrain movements in ways we modern day folk don’t think about. Good on ya for enjoying the costumed side of life! Love the Victorian outfit! It was wonderful to get know the author. I loved the interview. I love horseback riding…both English & Sidesaddle. I don’t get to ride much anymore and miss it. I love Syrie’s purple dress she handmade. The detail is exquisite. Syrie is multi-talented. I also think the antique dress is great! love your picture in costume. I love your black dress and that hat with the flowers is gorgeous! Thank you for the giveaway. She writes so beautifully and she is also talented with the needle. Geez some people were standing in the right lines when handing out talent. Thanks for this interview it was like I was sitting with Syrie. You have a unique connection to her so it was I am sure so fun to play. I hope that we have more holiday tours to mark future book releases. It has been a fun way to ring in the holidays with Jane A.
I adore all things Jane. This story sounds wonderful & I’d love to read it sometime! que linda entrevista!! love Janee!! Previous PostPrevious Spotlight on Gwen Jones’ The Laws Of Seduction + Guest Post! Next PostNext Spotlight on Sandra Brown’s A Treasure Worth Seeking and Love Beyond Reason + Exclusive Teaser + Contest!